A Series Bass Combo Amp with Aluminum-cone Driver! Great for practice, rehearsals or performance in small venues, the Hartke A70 features a 70 watt amp and a 12" aluminum driver. The A70 features low, mid, high and bright tone controls, XLR balanced outputs, effects loop, and chrome hardware. The A70 also delivers a 7-band graphic EQ for finer tone control. The A70 features Hartke's "kick back" enclosure design that allows you to angle it upward for easier monitoring, or stand it straight up for front coverage. Like all models in the Hartke A Series, the A70 has a CD input, XLR balanced output, and an effects loop, as well as a headphone jack. The Hartke LH500, like its big brother, has a classic 12AX7 Class-A tube front-end design with a solid-state output. Developed with the HyDrive cabs in mind, the LH500 also has more than enough power and tone control to drive any cabinet on the market. The Hartke LH500 provides you with Treble and Bass Shelving to give its warm tone a little edge - or use the bright and limiter switches to further sculpt your sound. 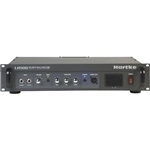 The Hartke LH500's intuitive front panel also makes adjustments on the fly a breeze. The LH500 packs a big punch in a portable, roadworthy package. A two-rackspace metal frame chassis, steel faceplate and handles allow for easy, safe transport from gig to gig. With the needs of modern bass players largely centered around volume and versatility, the Hartke LH500 is an ideal solution that gives you plenty of options to create the exact sound you're looking for. Hartke's newest HyDrive cabinet, the HX112, is suitable for any playing style. The cabinet contains a 12" 300 watt HyDrive hybrid cone driver and a high frequency compression driver. This is contained in a tuned, ported bass cabinet that weighs a little less than 30 pounds. For louder sound add a second HX112 and you will shake any stage. To further make the HX112 portable friendly the cab features inset side handles, removable casters and a steel grill for safe and easy transport.